Since the Western countries are directly and indirectly supporting the Israeli occupation, it is a shame and disgrace, that they walkout at this very speech, which brings into light the Israeli war-crimes and the Western implicite consent. Anti-semitism is a form of racism, which is to be defined as hatred against and repulsion from Jews because of their religion, culture and their very existence. However, the UN speech of Mr Ahmadinejad shows no ''anti-semitic rhetoric'', but is referring to the zionist character of the State of Israel, with special reference to the ethnic cleansings of the Palestinians in 1948, as to the humanitarian consequences of the 42 years Israeli occupation. So the very execution of Resolution 181 was contrary with the right on selfdestination of the Palestinian population, living in Palestine for ages. 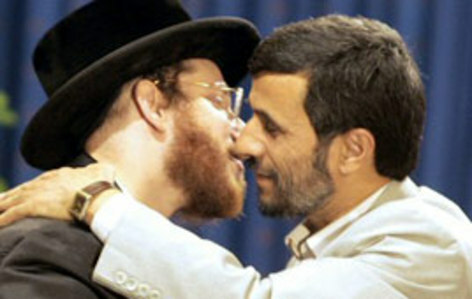 The Ahmadinejad speech, is simply qualified by the Western countries as ''anti-semitic'', refusing to acknowledge the difference between real anti-semitism as critics on the Israeli military behaviour. This is the more striking, since the Western countries are implicitly supporting the Israeli occupation, by refusing to summon Israel to withdraw from the occupied Palestinian territories, based on UN Security Resolution 242, dd 1967. And not to forget the de facto American support for the Israeli occupation by the military support of 3 milliard dollars every year. The Ahmadinejad speech is not anti-semitic at all, but is justly critizising the political and military conduct of Israel as a State, as the Israeli occupation. Therefore I regard is as a gotspe, that the Western countries, that never took any diplomatic or other sanctions against unlawful Israeli military behaviour, even at the Gaza-offensive, have walked out at this very speech. As long as the Western countries refuse to summon Israel to withdraw from the occupied Palestinian territories, they are co-responsible for the humanitarian consequences of the Israeli occupation. ''In a statement, spokesman to the US mission to the United Nations said "it is disappointing that Mr. Ahmadinejad has once again chosen to sepouse hateful, an offensive and anti-Semitic rhetoric." ''"one nation solemnly promised to a second nation the country of a third". At april 13th 1948, 4 days after the Deir Yassin massacre, there was an Arab military attack on a medical convoy travelling to Haddassah Hospital, with as a tragic result the death of 77 doctors, nurses, and other Jewish civilians. 4 - Captured combatants and civilians under the authority of an adverse party are entitled to respect for their lives,dignity, personal rights and convictions. They shall be protected against all acts of violence and reprisals. They shall have the right to correspond with their families and to receive relief. The 4th Geneva Convention is appliable on Gaza, since according to International Law, Gaza is still occupied territory, because Israel is controlling its borders and air.